WTF FUN FACT #6298 THERE ARE RINGS THAT LET YOU FEEL YOUR PA - ProudMummy.com the Web's Community for Mums. 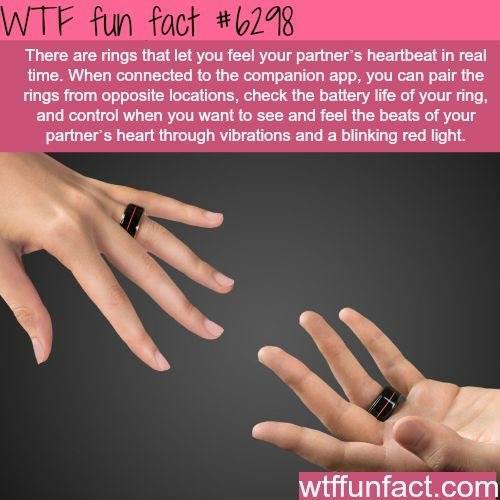 WTF FUN FACT #6298 THERE ARE RINGS THAT LET YOU FEEL YOUR PARTNER'S A HEARTBEAT IN REAL TIME. WHEN CONNECTED TO THE COMPANION APP, YOU CAN PAIR THE RINGS FROM OPPOSITE LOCATIONS, CHECK THE BATTER LIFE OF YOUR RING, AND CONTROL WHEN YOU WANT TO SEE AND FEEL THE BEATS OF YOUR PARTNER'S HEART THROUGH VIBRATIONS AND A BLINKING RED LIGHT.